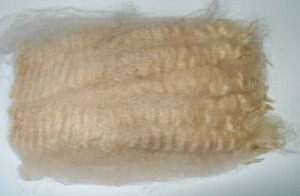 The last of our 2011 alpaca yarns have arrived! These all natural, undyed, 100% alpaca yarns come from our herd of 41 alpacas raised on the Blue Ridge Parkway in Virginia. We start with a careful breeding program by selecting breeding combinations that will give us the finest and most dense fiber. Examples of the success of our breeding program are seen in Reserve Color Champion Peaceful Heart’s Lord Tennyson and his son, Tennyson’s Beckett of Peaceful Heart. Bill shearing in the background, assisted by Mike. David shearing in the foreground, assisted by Claire & Susan Gleason. We shear our alpacas each May. As David has gotten older, he has become our primary shearer, and does a beautiful job. 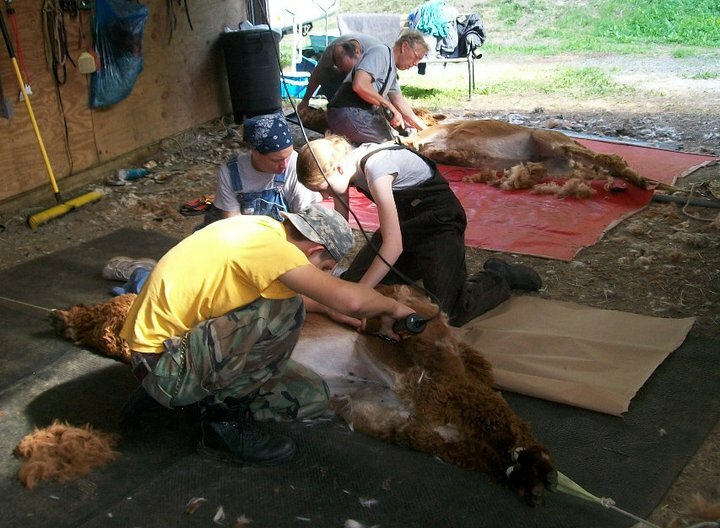 We were initially trained to shear by Bill Watkins of Frostglen Alpacas, who teaches a shearing seminar for other alpaca farmers at our farm each year. The shearing method we use focuses on maximizing the quantity of useable fiber off each alpaca and keeping the three grades of fiber (blanket, neck, and legs/belly) separate as we shear. Once the fiber is off the alpaca, I sort it by color and fineness to create the best yarns possible. 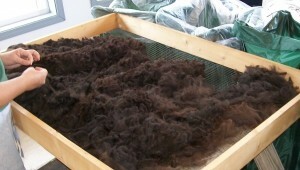 Alpaca fiber is sorted by the fineness of the fiber, which is measured in microns. We test a sample from all our alpaca blankets to confirm the fiber diameter for each. For reference, human hair is approximately 100 microns thick. Alpacas have been bred for their fine fiber for over 600 years, since they were first domesticated by the Incas. The fineness of the alpaca fiber is what makes it so soft and comfortable to the skin. Alpaca fiber and yarn is named by the thickness of the fibers that make up that yarn. Baby alpaca yarn is a great example, because it can be made from the fiber of any alpaca with fiber under 23 microns, no matter what their age is. The list below is a guideline for classifying the fibers, and how it relates to the yarn we make. You can see that there is very little difference between each of the grades, and proper sorting keeps the fiber that makes up a yarn more consistent. This means that all the yarns have a lovely feel. Grade 6 alpaca yarns and yarns made from our alpaca’s leg and belly fibers are best used for rugs, baskets or other items that are not worn close to the skin. The finer the grade of fiber and yarn, the softer it will feel, with the royal baby and baby alpaca yarns having the most luxurious feel. 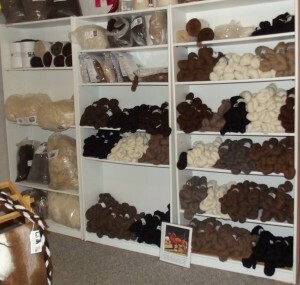 We invite you to come by the farm to get your hands on the variety of the yarns as well as our beautiful alpaca rovings. After the fiber is sorted and I decide how we would like each to be processed, I send the raw and sorted fiber to the mill. We work with a Tennesee fiber mill that processes the fiber into either alpaca rovings for spinning and felting or alpaca yarns for knitting, crochet and weaving. You can see our alpaca yarns at our online store or at the farm. I must say that they are our best yarns ever. The majority of the yarns have been done in a 3 ply worsted weight and they all have an incredible feel. Have fun knitting, crocheting and weaving.